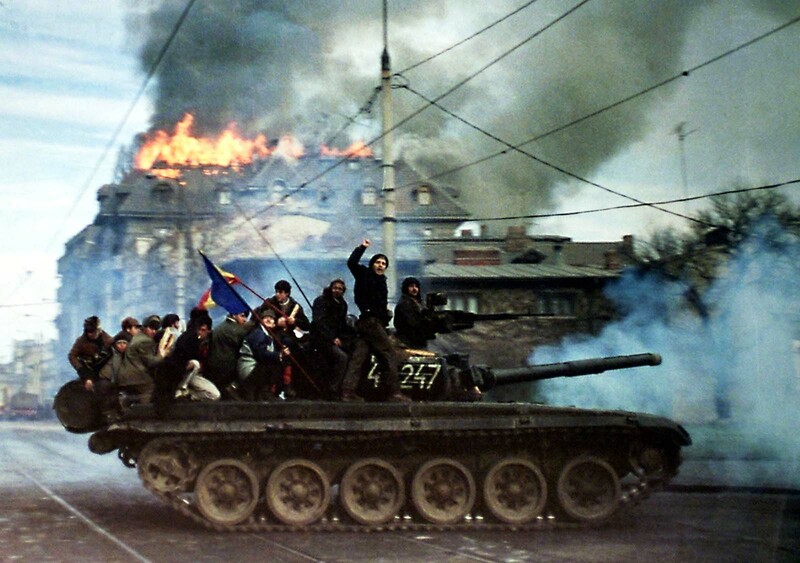 Romanian demonstrators sit on top of a tank as it passes in front of a burning building, December 22, 1989. Nicolae Ceausescu ruled Romania for 21 years, earning a reputation as a brutal dictator. During his reign he developed the largest network of spies in Eastern Europe, silenced his opposition with a secret police force known as the Securitate, and eventually threw the nation into tremendous debt and economic turmoil. Ceausescu maintained an independence from the Soviet Union that was unparalleled in the Eastern Bloc. In the late 1980s, as the Soviet Union and Eastern Bloc countries began to liberalize, Ceausescu maintained his hardline policies. In 1981, Ceausescu began an austerity program designed to enable Romania to liquidate its entire national debt ($10 billion). To achieve this, many basic goods, including gas, heat and food were rationed, which drastically reduced the standard of living in Romania. The secret police, Securitate, had become so ubiquitous as to make Romania essentially a police state. Free speech was limited and opinions that did not favor the Communist Party were forbidden. Even by Soviet bloc standards, the Securitate was exceptionally brutal. 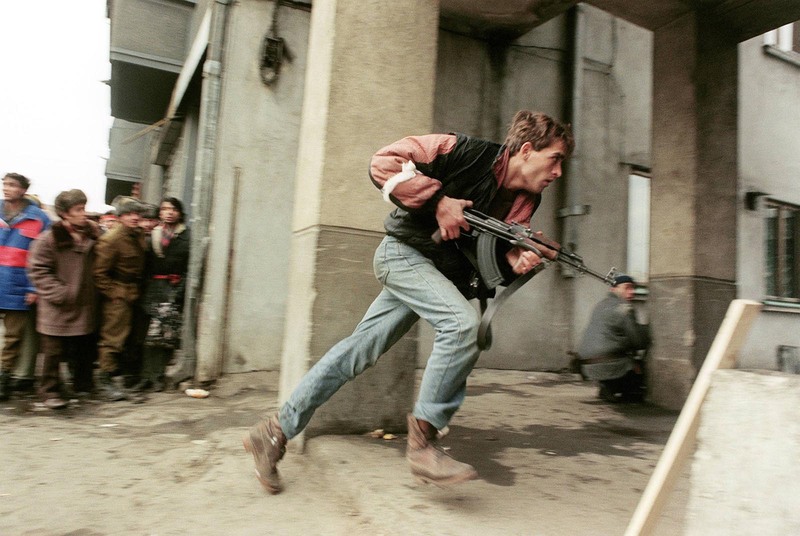 An anti-Communist civilian fighter armed with a Kalashnikov AK-47 chases the supposedly Securitate secret police agents loyal to the communist power during a street-fighting. A group of anti-Communist civilian fighters along with a Romanian soldier supporting anti-Ceausescu’s activists, protect themselves behind an armoured personnel carrier from snipers fire shot by the supposedly Securitate secret police agents loyal to the communist power . Soldiers run for cover during crossfire between pro-Ceaucescu troops and anti-regime supporters near the Republican square in Bucharest. 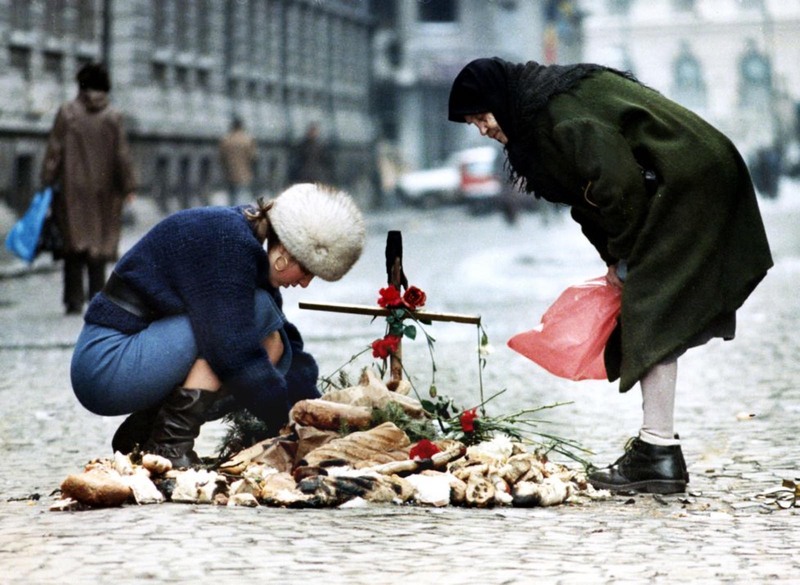 The Romanian Revolution was swifter and more violent than the other Eastern Bloc revolutions of 1989. It began on December 15 in Timisoara, when demonstrations support of dissident Hungarian priest Lazlo Tokes rapidly fomented widespread protest. 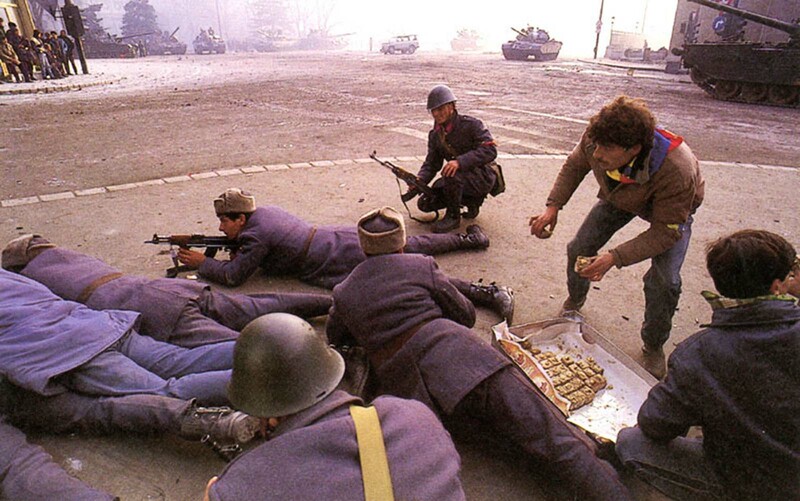 Since Romania did not have riot police (Ceausescu, who genuinely believed that the Romanian people loved him, never saw the need for them), the military were sent in to control the riots because the situation was too large for the Securitate and conventional police to handle. However, the chief of minister of defense, sent soldiers in without live ammunition. The army failed to establish order. The next day, trains loaded with workers originating from factories in the South arrived. The regime was attempting to use them to repress the mass protests, but after a brief encounter they ended up joining the protests. One worker explained: “Yesterday, our factory boss and a Party official rounded us up in the yard, handed us wooden clubs and told us that Hungarians and hooligans were devastating Timișoara and that it is our duty to go there and help crush the riots. But I realized that wasn’t the truth”. 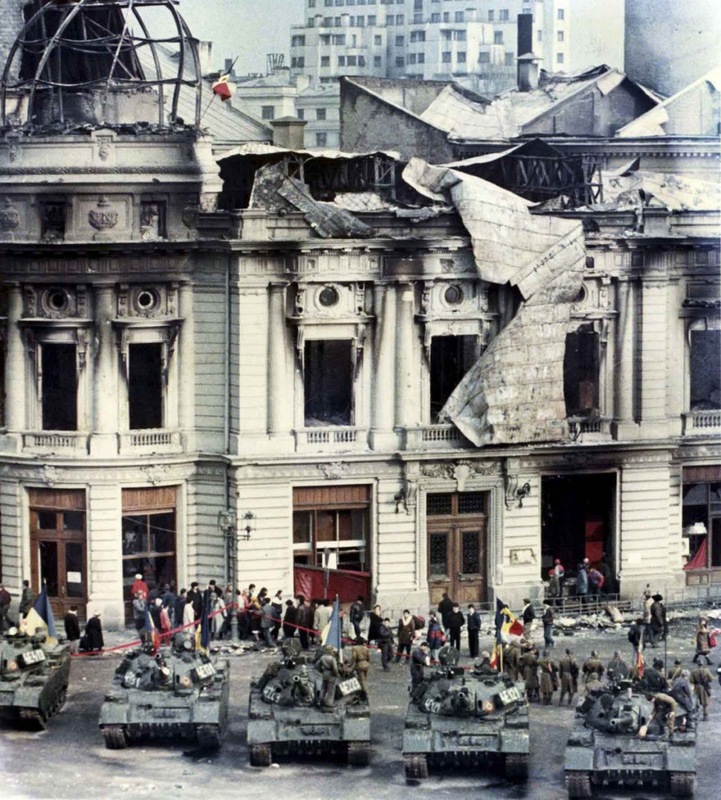 View of tanks and damaged buildings in Bucharest’s central square during the Romanian Revolution. 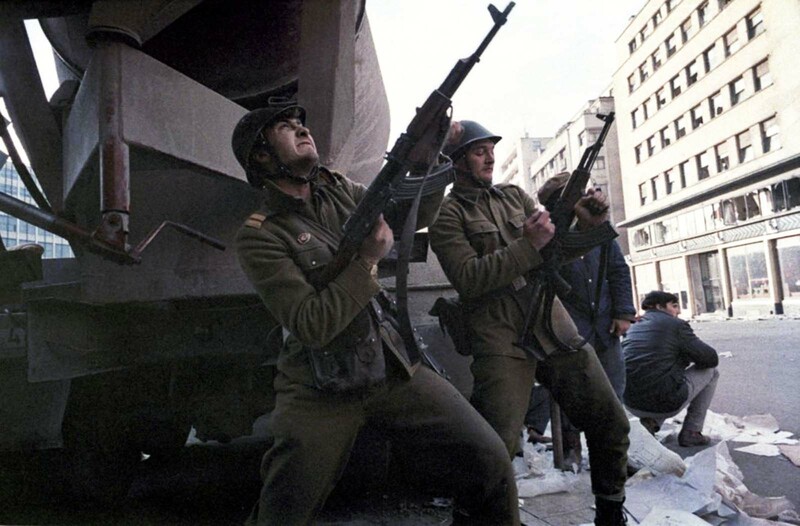 A Romanian soldier loads his automatic rifle as another shoots during heavy fighting against pro-Ceausescu troops in central Bucharest. 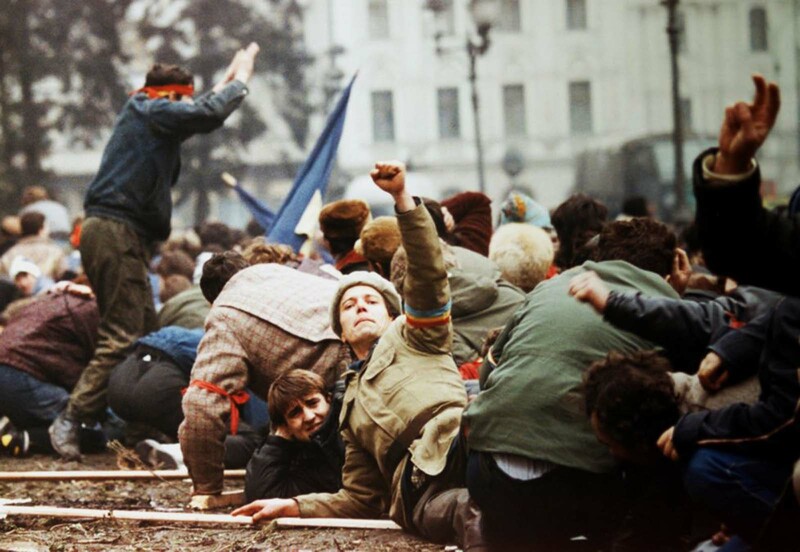 An anti-Ceaucescu revolutionary makes a V-sign as demonstrators lie on the ground to escape from the crossfire between the pro-Ceausescu troops and anti-regime supporters. Members of special troops lie dead in front of their armored vehicles after being shot by the army in the Bucharest suburb of Taberei. 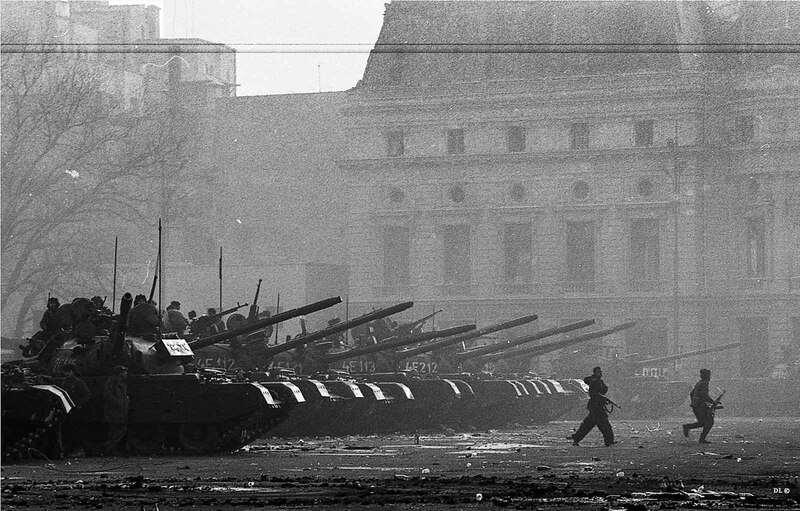 Civilians standing behind tanks after a battle between the army backed up by armed civilians and pro-Ceausescu supporters in Bucharest. Cakes for the soldiers fighting against the government. 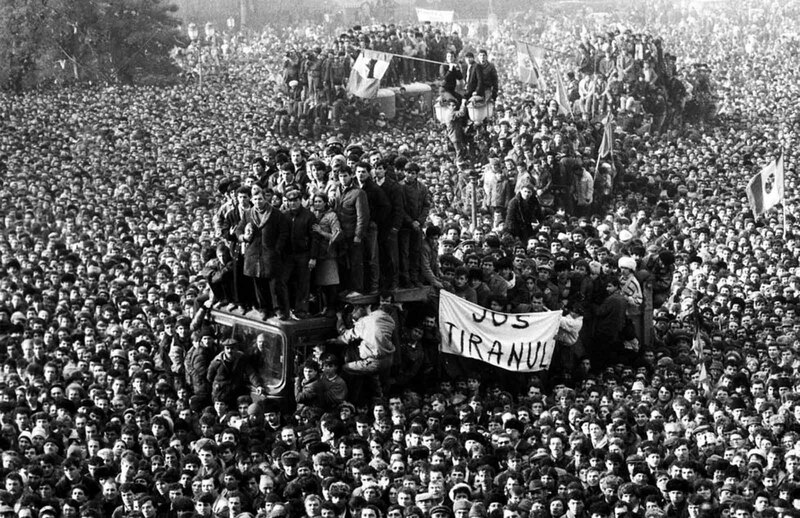 On the morning of 21 December Ceausescu addressed an assembly of approximately 100,000 people, to condemn the uprising in Timișoara. Party officials took great pains to make it appear that Ceausescu was still immensely popular. Thousands of workers were bussed into the square under threat of being fired. They were given red flags, banners and large pictures of Ceausescu and his wife. The crowd were given orders on where to stand, when to applaud and what to sing. The front rows of the assembly were made up of low-level Communist Party officials and members who acted as cheer-leaders. Ceausescu blamed the Timișoara uprising on “fascist agitators”. However, Ceausescu was out of touch with his people and completely misread the crowd’s mood. The people remained unresponsive, and only the front rows supported Ceausescu with cheers and applause. Eight minutes into the speech, some in the crowd actually began to jeer, boo, whistle and utter insults at him. In response, Ceausescu raised his right hand in hopes of silencing the crowd; his stunned expression remains one of the defining moments of the end of Communism in Eastern Europe. The entire speech was being broadcast live around Romania, and it is estimated that perhaps 76% of the nation was watching. Censors attempted to cut the live video feed, and replace it with Communist propaganda songs and video praising the Ceausescu regime, but parts of the riots had already been broadcast and most of the Romanian people realized that something unusual was in progress. His security guard appeared, disappeared and, finally, hustled Ceausescu off the balcony. At that very moment, many everyday Romanians saw the weakness of Ceausescu’s regime for the first time. “It is as if, in that moment, everyday Romanian’s saw the possibility, saw the reality of the weakness of Ceausescu’s regime”, according to the Center for History & New Media. “Those moments of Ceausescu’s weakness and the power of popular pressure explain why, a mere 48 hours later, Ceausescu was attempting to flee Romania, all power lost”. Tanks guarding the government buildings. Romanian demonstrators gathered in front of the headquarter of Romanian Communist Party in Bucharest. Tanks in front of a burned government building. The following day, violence erupted on the streets of Bucharest. Senior generals gave up their support for Ceausescu, and the remaining loyal sections of the army and Securitate were overrun. At approximately 09:30 on the morning of December 22, Vasile Milea, Ceausescu’s minister of defense, died under suspicious circumstances. A communique by Ceausescu stated that Milea had been sacked for treason, and that he had committed suicide after his treason was revealed. 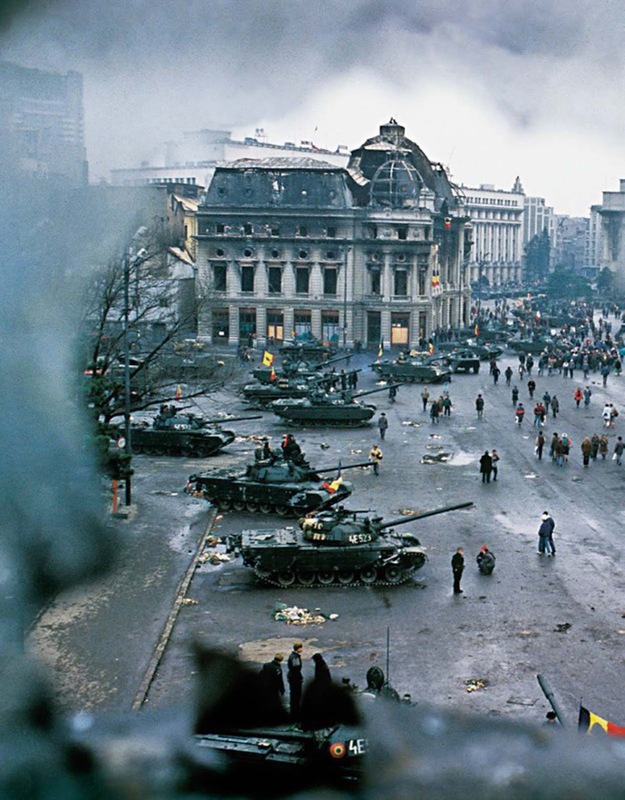 The most widespread opinion at the time was that Milea hesitated to follow Ceausescu’s orders to fire on the demonstrators, even though tanks had been dispatched to downtown Bucharest that morning. Milea was already in severe disfavor with Ceausescu for initially sending soldiers to Timișoara without live ammunition. The rank-and-file soldiers believed that Milea had actually been murdered, and went over virtually en masse to the revolution. The senior commanders wrote off Ceausescu as a lost cause and made no effort to keep their men loyal to the regime. This effectively ended any chance of Ceausescu staying in power. As crowds stormed Communist Party headquarters, senior officials directed the Ceausescus to escape by helicopter; the shaken couple was said to be carried aboard by bodyguards shortly after noon. The helicopter was forced to land before it could reach its intended destination because of reports that the army would shoot it down. 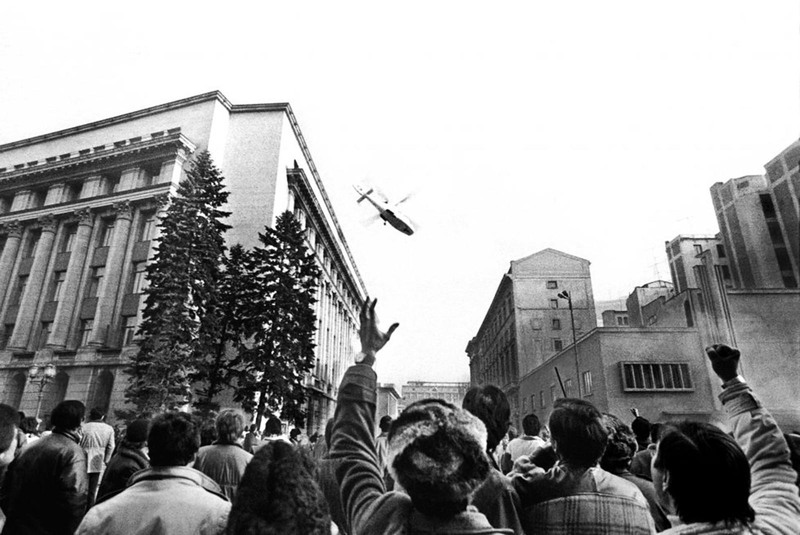 People gesturing towards a helicopter in which the country’s communist dictator Nicolae Ceausescu fled the Romanian Communist Party Central Committee headquarters. The Ceausescus were taken to a military base in Tergoviste and held for three days. In the chaos of Ceausescu’s ouster, the newly formed National Salvation Front (NSF), a loosely aligned organization of anti-Ceausescu forces, took control of the government with former Communist Party member Ion Iliescu as its leader. On Dec. 24, NSF leaders met secretly in a Defense Ministry bathroom and decided to try the Ceausescus before a military court in Tergoviste on Christmas Day. “The verdict, though not stated, was clear, since the firing squad traveled in the same helicopters with the judges”, writes The New York Times. After just a one-hour trial, with Iliescu present, the Ceausescus were found guilty of genocide and other crimes, and sentenced to death. They were placed against a wall and, before they could be blindfolded, shot multiple times by three soldiers. Others present would fire shots at the couple after the execution. “They said they wanted to die together so we lined them up, took six paces back and simply opened fire”, described Octavian Gheorghiu, a member of the firing squad. “No one ordered us to start, we were just told to get it over with”. The next day, the NSF released video of the trial and pictures of the Ceausescus’ dead bodies. That same day, the lingering violence in Bucharest came to an end. The Ceausescus were placed against a wall and, before they could be blindfolded, shot multiple times by three soldiers. 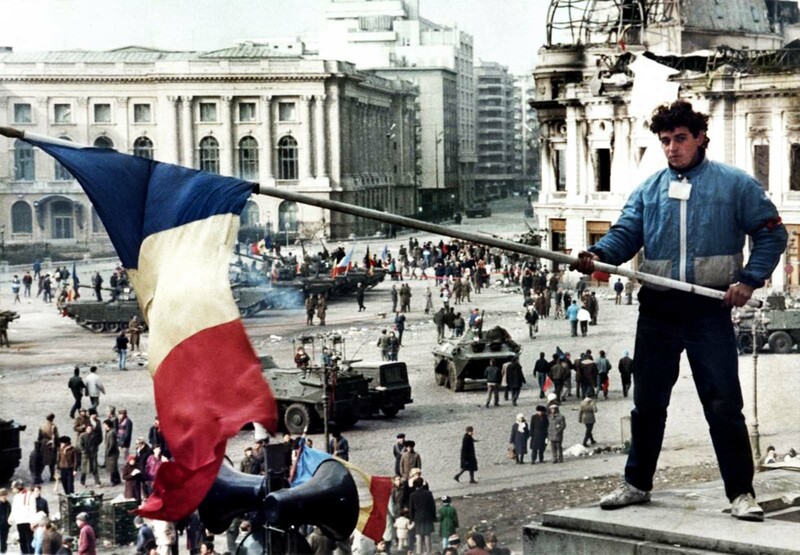 A young man waves a Romanian flag with the communist symbol cut out over Bucharest’s Republic Square on 26 December 1989, the day after Ceausescu was shot. 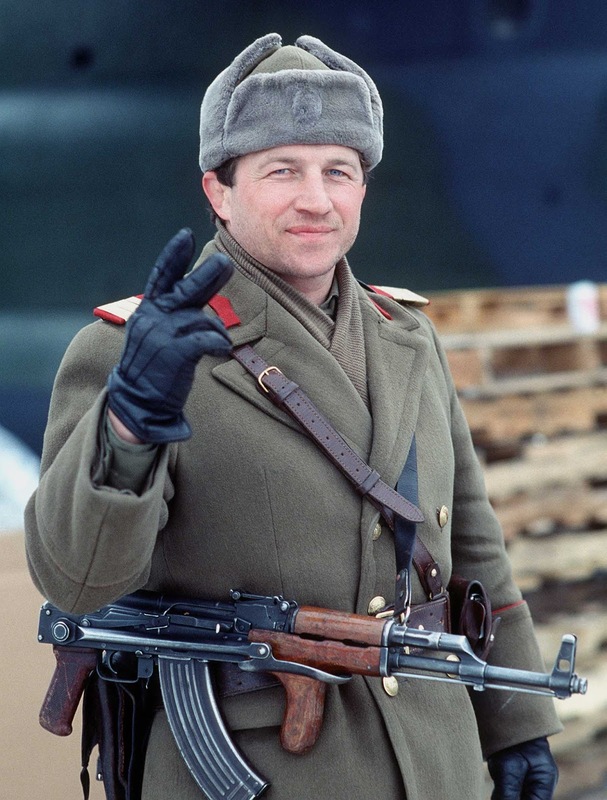 A Romanian soldier gives the victory sign on New Year’s Eve 1989, he has removed the communist insignia from his headwear. A student tends a small shrine in the middle of the main street outside Bucharest university watched by an old woman. 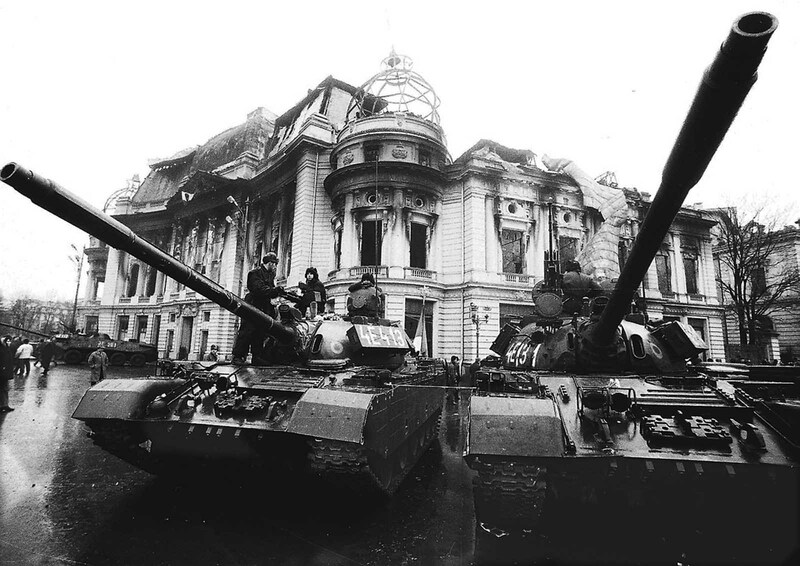 The total number of deaths in the Romanian Revolution was 1,104, of which 162 were in the protests that led to the overthrow of Nicolae Ceaușescu (16–22 December 1989) and 942 in the fighting that occurred after the seizure of power by the new political structure National Salvation Front (NSF). The number of wounded was 3,352, of which 1,107 occurred while Ceausescu was still in power and 2,245 after the NSF took power. 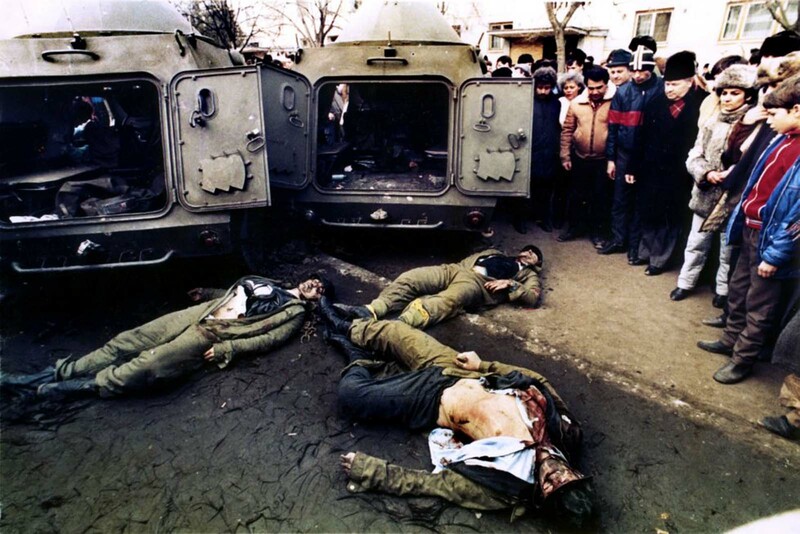 The Ceausescus were executed at 4:00 pm local time at a military base outside Bucharest on 25 December 1989. The firing squad began shooting as soon as the two were in position against a wall. In 1990, a member of the National Salvation Front reported that 120 bullets were found in the couple’s bodies. The firing happened too soon for the film crew covering the events to record it in full; only the last round of shots was filmed. 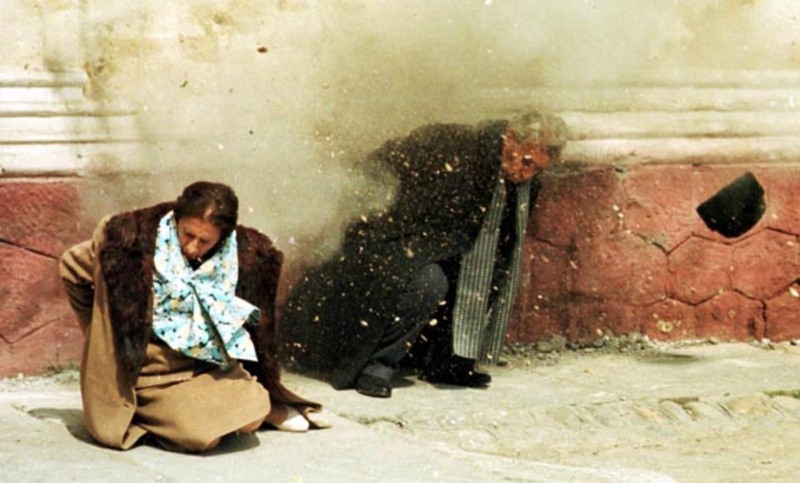 Before the sentences were carried out, Elena Ceausescu screamed, “You motherfuckers!” while being led up against the wall; at the same time Nicolae Ceausescu sang “The Internationale”. The Ceausescus were the last people to be executed in Romania before the abolition of capital punishment on 7 January 1990. During the revolution, the Central University Library was burned down in uncertain circumstances and over 500,000 books, along with about 3,700 manuscripts, were destroyed. 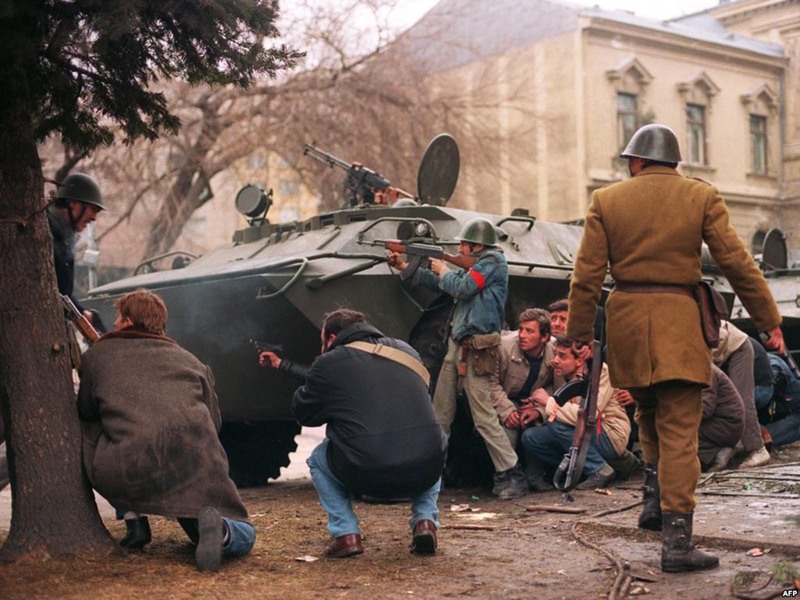 (Photo credit: Reuters / Getty Images / Denoel Paris – “1989 Libertate Roumanie”). It's not quite like that - there were no "pro-Ceausescu supporters" to fight back. 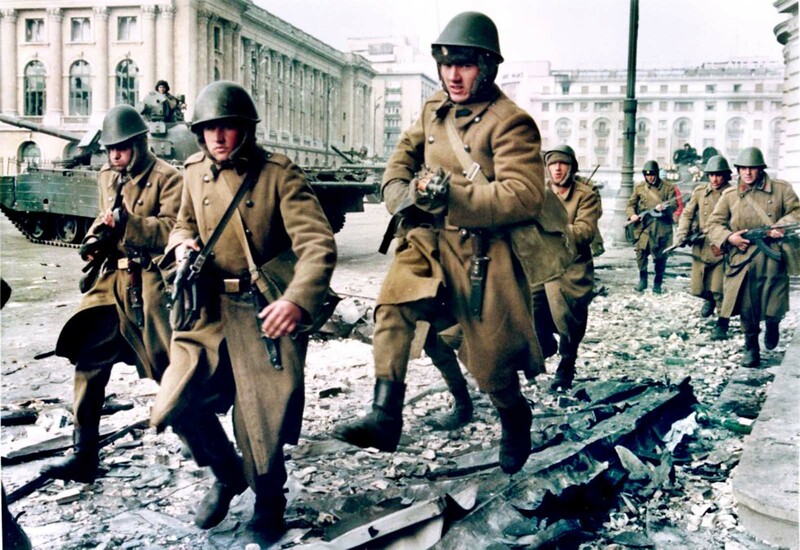 The special troops shot by the army are part of a story that generates anger even today: one romanian general who was documented as a russian agent, somehow became the defense minister. He ordered the anti-terrorist unit to defend the ministry building from a terrorist attack, while the building was protected by the belt of tanks you can see in the pictures. When the anti-terrorists troops arrived, he order the military to open fire and kill them all. Coincidentally, those troops were led by the person who documented the general's espionage activity, and were the only ones who were trained to eliminate the supposed terrorists, believed to be russian special forces (the Ukraine, Georgia, Moldova and other countries recipe is not new). That's absolutely correct, well done.. The 1989 Revolution was the biggest mistake that could be ever done by Romanian people. I know the Dictator has his problems and reflected over the people, but seriously, let's take a look of what he made, what he achieved. One of the greatest european industrial complex, agriculture, very flourish oil platforms across country, a very good army etc etc. He refused to enter in Praga (see Prague Spring), and i think this was a brave act from him. All he wanted to do is to improve the country, and he done that step by step, but hey here it comes in equation western states, and some "people" who feared about what Romania could do. But yeah, that was back then, a great epoch, but now let's live in present, where everything is fucked up, Romania land is divided by corporations and the list can continue. And yeah, forgot to mention. How could a state have such cruel heart to kill like pigs his leaders, seriously? Most Romanians would have you share the same fate as him for saying that. And I sincerely hope you are not a Romanian, that way you can be given the benefit of doubt and ignorance. All those perks and benefits you enlisted first of all were most probably embellished by the communist media heads at the time. And even so, it all came with a cost. And that was the cost of the welfare of the people. People died on the streets. The same streets PAID masses or people were rallying to make it look like he was actually a loved leader. Entire families lived on a couple of loaves of bread per week. People were forced to hang portraits of the tyrant that mistreated them on their walls. I cannot say or tell where you are from, but from your comment I can assume that you did not live or even born in a country with such complications. But before you accuse an entire people of wrongfully ridding of their leader, who was unfit for rule, you should most definitely listen to what Romanians who lived in Ceausescu's days think. You dubbed Communism in Romania, now a synonym to oppression and censure, as "a great epoch". You are wrong. Maybe China has the whole Communism thing going well, but this is not comparable. It is also true that the Romanian people made mistakes (in my opinion, the biggest was our choices with our parliament representatives) but I can assure you that the abolishing of communism in Romania was a step forward. Addressing your last statement. You ask how could Romanians have had the heart to kill him like an animal. I ask you, how had he the heart, to threaten his already beaten and maltreated subjects with bulldozing towns smaller than 2000 down to rubble in order to build agricultural supercentres. The man was heartless, greedy for power. He plunged Romania in massive debt for his massive architectural ambitions. I don't think Andrew is a Romanian name. So, please Andrew, just go live some time in north Korea, and comment after that about my country. I am all with Radu's comments! I was there ,physically, emotionally, mentally..all those days I was with the others, on the streets, day and night..I cannot and will never forget! The triumph of good over evil! the triumph of defeating oppression and humiliation! BUT... alas~~ later the power has been stolen again and the game of manipulation,lies and corruption is back on stage! such an irony! such a tragic course of events! Nevertheless I trust history and the going-forward of civilization will straighten up was are still remnants of a unhuman and cruel system! I live in Canada, and fully appreciate what the common Romanian had to live through. I cannot fully understand what daily life was like for you but I can say, well done to you. I now have a girlfriend that was born and lives in Bucuresti, and I cannot even think of what it would have been like for her or her parents. I am glad they all survived that horrible time, and I hope and pray for your future, even though you now still deal with governmental corruption. From one simple Canadian, I say God Bless and keep you all, and I hope for better times for all Romanians. It wasn t a revolution, but a coup d etat. I would call it a revolution, even though it was an extremely short one. The basic definition of "revolution" is that some fundamental change needs to take place in society, whether that's cultural, economic, or political. A coup d'etat means that there was a change in leadership through military means, but not necessarily that there's any change in society. The fact that this turbulence in Romania produced economic changes such as the elimination of price controls and the privatization of state-run farms and factories means that it falls into the category of revolution. I agree that Iliescu's actions during the Mineriad were tactics that Ceaușescu would approve of, and this suggests that perhaps change was not as complete as hoped, but one cannot ignore that the privatization produced by this event is indeed an economic revolution. And even though the PSD remains the dominant party, the fact that opposition parties are now allowed to exist constitutes a political revolution, as it is a change from the one-party system. And the CIA played what part? "...eventually threw the nation into tremendous debt and economic turmoil"
I am proud to be born and raised in Romania, and it's not a lie, I was born in 1975 and I made the hunger like almost everybody! The downfall of the Ceausescu regime in December 1989 happened very fast and for all but the most avid news watchers outside Romania it was story that unfolded in the background. Grainy photos and video from Romania had a tough time competing with Bush & Gorbachev's ongoing diplomatic breakthroughs, a new government in Czechoslovakia led by former Lech Walesa, the invasion of Panama and the general Christmas rush. North American and Western European pundits were still absorbing the fall of the Berlin Wall. They had drafted "1989 Year In Review" columns which celebrated a uniformly peaceful end to European Communism. To them the death by firing squad of Romania's dictator and his wife was an irritating aberration to be glossed over or even ignored.